The E3 interviews keep rolling in! 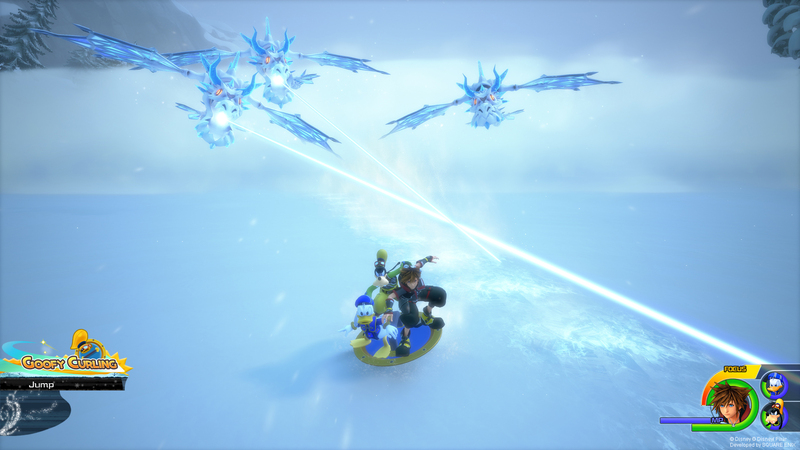 This time, Game Informer's posted a brief interview where Series Director Tetsuya Nomura discusses dealing with demo feedback, Sora's personality, and looking forward to the final battle in KINGDOM HEARTS 3. "The event wasn’t really to get feedback from anyone,” Nomura says. “It was to show it to everyone and hope everyone there would spread the word and the details about the game. That being said, I didn’t really go around asking for feedback, but the dev team, myself included, does look at all the comments that are online. It’s not that we will change things just because one person says this or that, but we’ve been constantly testing the game. We’ve been in QA for a while now, so we’re constantly adjusting the game based on that feedback and some of the comments online have been taken into consideration." KH3 will bring about the long-awaited conclusion to the Xehanort saga. Sora has faced Master Xehanort and his incarnations numerous times throughout the series. No matter what obstacles he's pitted against or threats he encounters, Sora always manages to endure and keep a bright smile on his face. But will he be able to maintain that unfaltering optimism this time? "He is a very bright character in general, but there will be many serious themes with Sora that involve [him] in Kingdom Hearts III. There will be a few times where Sora will be on the edge of despair, but because he’s so bright and he has that personality, he quickly brings it back to a neutral state. I think that’s a strength he has, and another strength he has is this trust and believe in others. I think that’s always been what helped him through the storyline and I think that will be another driving factor for him in Kingdom Hearts III." What do you think Nomura is setting up for the Final Battle? Let us know! There are so many great things to see that itâ€™s really difficult to say [just one thing]. I think what weâ€™ve done as an action game with the combat mechanics is just really great, and the story is a culmination of past decade and more. Of course, there are a lot of surprises that are even greater than the Aquaâ€™s surprise [in the Frozen trailer]. But I think I just want to say that the last battle in the game is something I want everyone to see as well as this new original location that Iâ€™ve really wanted to create for a long time now. If I had to say just one though, itâ€™d be the last battle. He is a very bright character in general, but there will be many serious themes with Sora that involve [him] in Kingdom Hearts III. There will be a few times where Sora will be on the edge of despair, but because heâ€™s so bright and he has that personality, he quickly brings it back to a neutral state. I think thatâ€™s a strength he has, and another strength he has is this trust and believe in others. I think thatâ€™s always been what helped him through the storyline and I think that will be another driving factor for him in Kingdom Hearts III." Would be cool if the location for Sora and Xehanort's final battle was in the old man's own Station of Awakening. I think the final battle will be at Daybreak town in the World Without Borders. I don't think it's Daybreak Town. Nomura said it's in a world he's been meaning to create for a long time now, and I think this is what he referenced in a past interview concerning something he's been meaning to do ever since he got to work into Final Fantasy. But it could be Daybreak Town if the count the World Without Borders as the original thing Nomura has been wanting to do, and Daybreak Town a part of it. Maybe the location he has wanted to put in the game for a long time is the Destiny Island mainland? He said original, so it has to be unique to the KH universe. And that is an important location that we haven't gotten to see yet. Also, note that he mentioned the last battle and the new location as two separate things he wants fans to see. The new location doesn't have to be the location of the final battle. Could that have been the first piece of info he's ever mentioned about Cable Town to the public? Also for the final battle my bet is on Kingdom Hearts as well. I think Kingdom Hearts will be a fully explorable world. I just donâ€™t think Keyblade Graveyard will cut it as the final dungeon. I'm just hoping he doesn't lash out at Donald and Goofy during his lower moments again. I hated that in CoM. But nah, I agree that Donald and Goofy shouldn't get it, especially since they've been there with him for like the entire journey, and the majority of the time it actually seems like its them that makes him snap out of it and go back on track. Maybe Xehanort will succeed in his plan and the worlds will once more be reunited into a single, merged one. How cool could that be? Maybe with each area transition, you also change the Party so it's even more diverse, so in one area you're fighting with Hercules and Sulley, while on the other you're fighting with Rapunzel and Baymax? End of the World already felt like a version of this, so maybe this time Nomura wants to make this world 100x times better. I hope that the KH team takes in the feedback and consideration for the combat aspect of the game. I want Abilities just like in KH 1 and 2. If they can add that then i will be A ok. Only thing is if they hadn't intended on adding abilities to the game and if they do, then that would mean they would have to re-adjust all the boss fights according to the abilities gained throughout the story but we shall see. As for the final battle, i can't see Sora winning the fight against an old man who is very knowledgable unless he learns from Sora after defeat lol. No need to fear, Nomura has said KH3â€™s level system is like KH1/2â€™s, which had abilities unlock at levels. I don't want to sound whiny, but I know early in KH2's life people had issues with Finishing moves, did anybody confirm if that's staying? I don't think BBS or DDD had that kind of system, I remember killing many bosses starting a combo, but I'd prefer not to have to pull off finishers. There are many moments in KH 2 where I had all my combo pluses on and enemies would keep hitting revenge value before I pulled off a finisher (before I realized a lot of magic counts as a finisher even as a first cast) like the Hyenas and Pete. Now that I've learned more from Level 1 strategies it's not an issue, but it'd be nice to know. I'm guessing we'll get set abilities from bosses and important battles as well? I think there was a term for them like event battles or whatever, when you see the panning camera and when you finish the screen does the boss flash/boom/slow mo. I don't want to sound whiny, but I know early in KH2's life people had issues with Finishing moves, did anybody confirm if that's staying? I wish I had thought of that when fighting the Rock Titan, I would have tested it out. I hated needing to use a finisher move to defeat a boss (thank gosh for magic though). I'm sure there's some video out there of someone not using the train attraction flow where they chip away at the Titan's head. I am so intrigued to see whatever's more of a shock value than Aqua being a Seeker of Darkness. Like, I feel that's the epitome of being surprised because so many of us were so confident in her being a guardian of light. I think the only thing that can top Aqua getting Norted is Sora getting Norted. He's the messiah who everyone revolves around then BAM he gets Norted and is the true final boss battle. Buddy, I'll eat my entire shoe, boot, slipper and sandal collection if that happens. So tired of characters fading away. Namine, Roxas, Xion, Terra, Aqua, Ventus. It keeps happening. I want them to actually interact with each other and have adventures. We just went through several games of just getting ready for their return. For any of them to just instantly fade away again after all that... ugh. So wait what happened to the Abilities that Party Members back in KH1/2 used to had do we know if the Abilities from KH1/2 are going to make a Comeback or not? (You know Treasure Magnet, Jackpot, MP Haste, Second Chance, Leaf Bracer, All Combo Plus)? Sora is definitely safe from kicking the bucket because he's confirmed to still be the main character after KH3 (thank god) and I really can't see Namine dying ether (also a huge yes), but I'm very unsure about the rest. I honestly hope they all live though. The only one who I wouldn't mind not coming back is Xion lol, and maybe Terra. I distinctly remember defeating the Rock Titan during the Premiere Event in the middle of a combo. I messed up using the attraction flow so I had to chip away at the health that was left. I believe when I fought Mysterious Onyx, I also was mid combo and not using a finisher. When he talks about something he always eantwd to make since FF, but never had the possibility of doing, I start thinking about consoles limitations in the past. I think the last battle will be massive in one way or another. Like, all keyblade-characters being playable without a loading screen, or Sora having RAX TAV and Kairi and riku as party members all at once. Maybe an enormous arena where all kinds of heartless and bosses come together to fight the guardians of light. I mean, the closest we ever had from a war was at KHII's hollow bastion. And playing the game today we can realize that the game doesnt have all of those heartless in real time. There is indeed some technological trickery in that battle due to console's limitations. But a war in a PS4/XoneX would certainly be much better. And possible. Part of me just keeps thinking back to the end of KH1... The World Terminus let you go into a small room based on each world. I just can't help but wonder if that final area will be a fight that jumps around between worlds, since Kingdom Hearts is a door that connects to every world. Nomura did something similar in KH2 with the Pete fight that switched between rooms in Timeless River. A war-scale battle that takes place throughout the worlds perhaps? Plot-twist: Xehanort uses Sora as his ultimate vessel, Riku fights Soranort in order to weaken Xehanort's control over him, and the final battle is inside Sora's Station of Awakening, where his finisher will be using all of the hearts he has been connected to. So it would pretty much be the same as fighting Riku-Ansem in KH1 except flipped, with the DDD final battle with the dark Ventus armor after? I sorta get what Nomura and his team had in mind, but to be completely honest. I think it should be a main priority to have feedback in mind from the very start once you let out demos for people to play. It builds some trust between the admirers of the series and the creators. Trust that will help their project be more successful. So Sora is going to go through some rough times? Just as I sorta could predict from earlier interviews. A balance between the fun and the more serious tone. Then again how serious it will be, depends. Just don't let Sora be out of character like he was when he sorta bullied Demyx in 2. Nah! what am I worried about. Surely they wouldn't do something like that again. (Remembers Sora calling Luxord a creep) Oh!.... right. This final battle is sounding more like it's going to be gigantic and probably also very proactive. What if it was a world that was constantly moving? I swear, if Nomura and Co. were able to bring this fight back in... whew. Granted, I'm sure if that were to happen, there'd be some pretty distinctive redesigns. That cut thing "sorta" lives on with Xemnas' Dragon. They're both born from the City that Never Was. But with how chimera-ish the King looks in that scan, and how a chimera is similar to Xehanort's nature, I wouldn't put it past Nomura to make World of Xehanort (Xehaworld, lol) something akin to a minotaur/chimera. Is it bad that I'm caring more about this than the final battle lol. Those designs look really cool. It would be amazing to see those back in. Gah the curiosity and all this info that Nomura is giving away is so intriguing. It would be cool if the fight was somewhere on the destiny islands. So the Xehanornt arc would end where it all began.